As you take a walk around Madiwala Lake, you will see that this area needs some help. And that’s what Murali Ramnath, cyclist and resident of BTM Layout thought too. Ramnath is a member of RideACycle Foundation (RAC-F), a Bengaluru-based non-profit organisation that encourages and promotes sustainable transport through cycling. It was this passion for cycling that got Ramnath and the foundation to do a preliminary study and propose a plan to build a cycling track and a pedestrian path around Madiwala Lake. On 31st January, the Bangalore Metropolitan Land Transport Authority (BMLTA) hosted a cycling workshop during which Gaurav Gupta, BMLTA member-convenor and commissioner of the Directorate of Urban Land Transport (DULT), requested the cycling community to propose suggestions to develop infrastructure for cycling in the city. “Gaurav Gupta really pushed us to do this. He has taken a lot of initiative,” says Ramnath. With a number of small and medium enterprises located in areas near Madiwala Lake, factory workers do not have proper connectivity to the main city, having to go all the way to Hosur Road for transport. “There are a number of people, the urban poor, who reside in Bommanhalli and Bilekalli. These people wanted a link. This is why we decided to take up this area,” explains Ramnath. He and a team of four spoke to residents and workers of the nearby factories, took photographs, studied the pollution of the lake and finally came up with a proposal. This proposal was submitted to the BMLTA on 17th February for development of a cycle track and pedestrian path around Madiwala Lake under Jawaharlal Nehru National Urban Renewal Mission’s (JNNURM) non-motorised transport scheme. The proposal included a map highlighting the desired ‘cycle route’ which connects Bommanahalli, Bilekalli and Roopen Agrahara to BTM Layout. The proposal talks about the purposes of the cycle track. The adjacent areas of Bommanahalli and Bilekalli are largely populated by labourers, garment workers and guards. Sampada points out that the working class here mainly uses bicycles to commute. Otherwise, they walk. And infrastructure for both is non existent. Ramnath says they also felt that with a number of educational institutions located nearby, students would also benefit. Apart from the cycle path, RAC-F is looking to address the problem of pollution. “There is a lot of garbage near the lake. Pedestrians have no place to walk,” says Ramnath. The foundation has consulted various organisations and experts regarding this proposal. The proposal includes suggestions to the BMLTA for future action, some of which include proper fencing of the lake and cleaning the surroundings, proper management of sewage and building cycle and pedestrian bridges. RAC-F has also mentioned the concerned department, estimated cost and time of the project for each of these suggestions. The cycle track is proposed to be 5 kilometers with a minimum width of 1.75- 2 metres and the pedestrian path is to be 1.5 meters wide. The proposal also suggests that the cycle path be constructed without any concrete or heavy construction work so as to not disturb birds in the area. Click here to view the Madiwala cycle track proposal. On 22nd February, a team of cycling enthusiasts, including Ramnath, met Gupta at Madiwala Lake to give him a first hand report and tour of the site. Gupta was taken on a boat, cycling and for a walk around the lake. “He (Gupta) has seen the proposal. He said he will speak to his technical advisors and also do a survey on how many people use the area for commuting. We are looking for experts to do a feasibility report on this,” says Ramnath. Gupta says RAC-F has submitted what needs to be done conceptually. The BMLTA will look into specifications, costing and the quantum of work involved. He says they also need to decide who will fund this project – state government, BBMP, BDA or some other body. Gupta says his interaction with the cycling community was to know about their preferences. “Their ideas are very good. As soon as the project report is ready, we will take it up. There is a lot of technical expertise involved,” he says. According to Gupta, the project report may take another two to three months to be completed as a lot of work is involved. “We have to identify people first. Architects, engineers, project manager, accountants and so on,” he adds. Even as this proposal has been presented, Ramnath and Pradeep B V of RAC-F attended a workshop in Pune last week to study cycling projects in the city so as to implement the same in other parts of Bangalore. Gupta says that projects like this should be supported. He is positive that Madiwala Lake will soon become a scenic spot. The Madiwala Kere Habba on April 11th truly was a celebration of the abundance in nature. In case you missed it, here’s a peek into all that transpired. 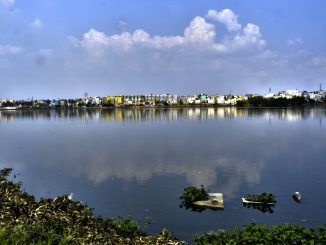 Both Kuvempunagar Permanent Resident’s Welfare Association and Karnataka Forest department are planning to work together for the development of Madiwala lake. This and more updates from BTM Layout in the last fortnight. This is absolutely brilliant proposal! Best wishes to RAC-F. Looking forward to see the project being implemented.